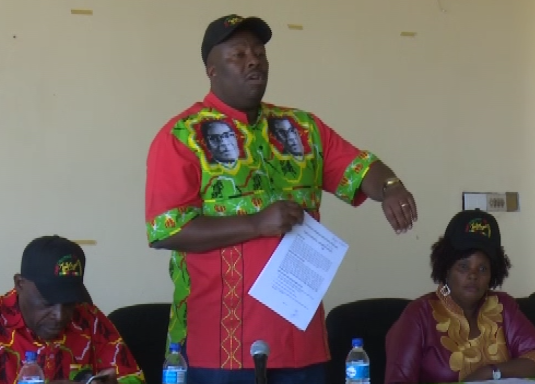 FORMER Zanu-PF national political commissar and G40 kingpin Mr Saviour Kasukuwere returned home yesterday after spending six months and six days in self-imposed exile. He fled the country last November alongside other G40 cabalists, Professor Jonathan Moyo and Mr Patrick Zhuwao, who remain in exile. Mr Kasukuwere, who was aboard a South African Airways plane, landed at Robert Gabriel Mugabe International Airport at midday. Donning a blue suit, red tie and a brown leather cap, Mr Kasukuwere immediately declared that he was staying out of politics and focus on his business and farming. He said it was sweet to be back home. Mr Kasukuwere confirmed life was not easy away from home. "You have to manage, can't you? Why would you want me to stay outside the country? You want me to remain outside the country? Unoda kuenjoya wega muno munyika iwewe? This is my home, so I must come back home. No push factors. Nothing. Home sweet home." Mr Kasukuwere said he was staying out of politics. "Tyson remains Tyson. Relaxed. Going farming. You know we are beneficiaries of the land reform. There is business to be done, that is the future. We will continue to work. "You see every soccer player must come to a time when he takes a decision that today I am not playing soccer. Maybe later, but for now just take it easy. Just run business. Go farming. Keep relaxed." Mr Kasukuwere said he made a personal decision to return. "This is a personal decision. I came to my country. This is my country. I came because I am Zimbabwean. I was born here. I will die here." Mr Kasukuwere confirmed he was ready for a day in court if there are any charges raised against him. He would not respond to condemnation by fellow G40 and NPF members Prof Moyo and Mr Zhuwao, who accuse him of selling out to the new administration. "You do not respond whenever they say something. You have to learn in life as an individual that there are times you have to make decisions that are in the interest of the individual. I have interest in farming and I have interest in the country," said Mr Kasukuwere, adding "this was a very difficult period and time." When asked on the State capture by the G40 cabal led by former First Lady, Mrs Grace Mugabe, he said: "I am sure you can talk to her. I am not her spokesperson. There were lots of allegations about this one has captured that, that one has captured that but surely isn't it time we move on? We need to move on. What has happened has happened. It is under the bridge. Let us move on." On the re-engagement with the international community by the President Mnangagwa led administration, Mr Kasukuwere said it was neccessary and a step in the right direction. "It is neccessary for the country to be part of the community of nations. We have got to be in there. We got to move our nation foward. We got to access lines of credit and so forth so that Zimbabwe moves on. I do not think anyone can be against the agenda that will bring about more opportunities for our people. Zimbabwe is for all Zimbabweans and in fact it is sad that we remain bogged down in conflict when what we should be doing is to say how do we move our nation foward. The people expect much more. They do not eat our fights. People want food on the table. They want jobs. People want better health system that is what must define Zimbabwe," he said. Mr Kasukuwere denied suggestions that he was coming back to topple Retired Brigadier General Ambrose Mutinhiri from the NPF leadership. "Zanu-PF is led by Mnangagwa. NPF Brigadier General Mutinhiri, MDC Chamisa, so which party are you asking me to be leading? I am not coming to push anybody out of any position," he said. When asked if he was going back into politics he took a long sigh and responded: "It will take a lot of convincing. There is a lot that all of us can do. We all can't be in one field. It appears the only industry working is politics but we must move beyond politics. Get to talk about business. Do you know the President of Switzerland? (Nobody knows him because they are into business). We need to get to a stage where whoever is the President is not the issue. What is an issue is the the health of the nation and the state of the economy. We need to make sure that the future of our people is looked after. The people of Zimbabwe are yearning to have a decent living standard…if we all work towards that objective this country will enjoy." On investors scrambling to Zimbabwe enticed by the policies of the new administration, Mr Kasukuwere said he was happy about it. "I am a Zimbabwean. Whatever is good for the people of Zimbabwe and in terms of our economy is what we must embrace and move our country foward. It is good to be back home." Mr Kasukuwere was briefly questioned by the police soon after landing at the RGM International Airport before he was released.